Below is a list of the core Chemical/Physical Water Monitoring programs conducted by the Bureau of Freshwater and Biological Monitoring. Click on any program to learn more. Reference/Background stations: Located throughout the state, these 7 stations are sited in undeveloped areas to determine least impacted water quality. This information is used to help gauge the status of water quality at other monitoring locations. 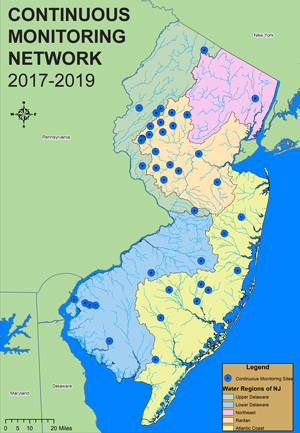 Watershed Integrator stations: These 23 stations are located at the pour-point or bottom (above the head of tide) of most of New Jersey�s larger watersheds. 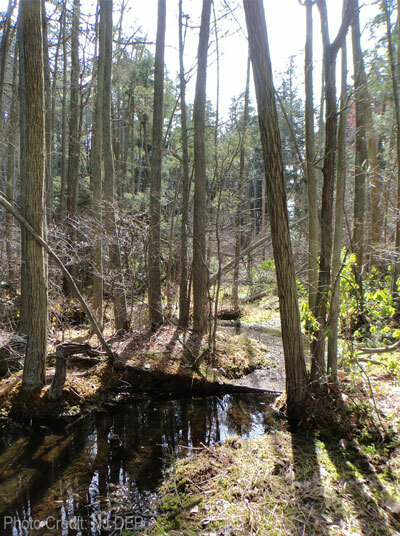 Data from these stations provides information on water quality for many of New Jersey�s largest river and stream systems. There are 50 probabilistic stations, which are re-selected every two years. These stations are selected using a Generalized Random Tessellation Stratified survey design. The purpose of this design is to enable statistically valid estimates of water quality condition for statewide assessments. To see the current list of 123 stations, click here. Sampling for this network is conducted quarterly by both BFBM and USGS staff to obtain data which represents water quality conditions in both warm and cold weather months. Parameters include field parameters which are analyzed on-site (e.g., dissolved oxygen, pH), conventional/nutrient parameters (e.g., phosphorus, total suspended solids), metals parameters (e.g., lead, mercury), pesticides (e.g., atrazine, carbaryl) and sediment parameters (metals, nutrients, and polyaromatic hydrocarbons (PAHs), and polychlorinated biphenyls (PCBs)). To see the full list of parameters, click here. Field and conventional/nutrient samples are measured or collected at all sites during each quarterly site visit. 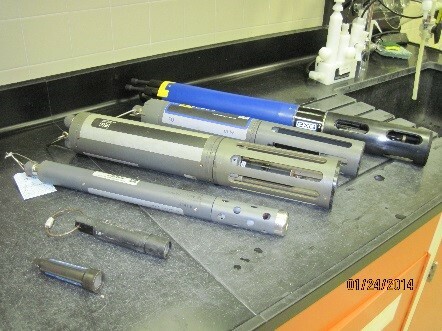 Metals, pesticides, and sediment samples are collected at a reduced frequency. Metals samples are collected twice a year at all background stations and at a subset (22 reselected every two years) of land use indicator and watershed integrator stations. Pesticide samples are collected once a year all background stations and at a subset (22 reselected every two years) of land use indicator and watershed integrator stations. Sediment samples are collected at a subset (~20 per year) of probabilistic stations. In 2014, New Jersey employed a rotating regional approach to integrated water quality assessment required under Sections 303(d) and 305(b) of the federal Clean Water Act. 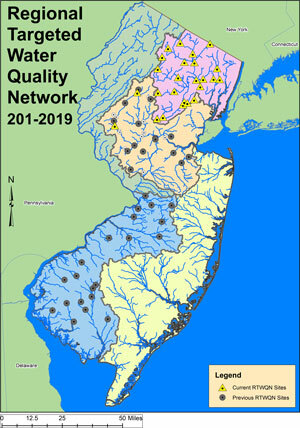 Through this approach, the Bureau of Environmental Analysis, Restoration and Standards conducts a streamlined assessment of statewide water quality along with a more comprehensive, detailed assessment of water quality in one of New Jersey�s five water regions (Atlantic Coastal, Raritan, Lower Delaware, Upper Delaware and Northeast each assessment cycle [every 1-2 years]). This produces a comprehensive assessment of the entire state every ten years and will support development of measures to restore, maintain, and enhance water quality tailored to the unique circumstances of each region. The Regional Targeted Water Quality Network was established in 2014 to support this approach. During each monitoring cycle (1-2 years), 25 stations are monitored in regions prioritized by the DEP�s Bureau of Environmental Analysis, Restoration and Standards. Sites targeted for monitoring are selected based on a list of prioritization criteria (e.g. historical monitoring data, land use variables). 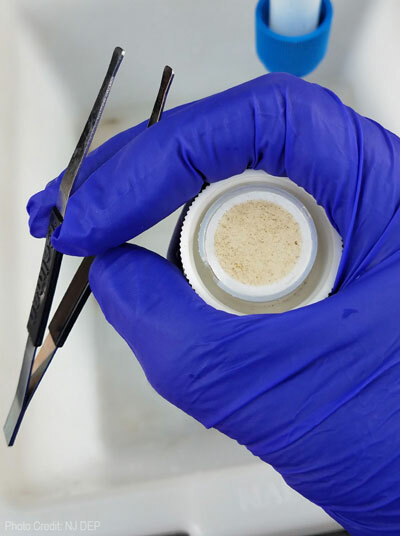 A greater emphasis is placed on waters that currently have no water quality data or ones that are lacking enough data to make assessment decisions. Beginning in 2019, monitoring will be conducted in the Northeast and Raritan regions for a period of one year. See the map or click on the station list button below for the 25 current monitoring stations as well as information on previously monitored stations. To achieve a comprehensive dataset, the network monitoring stations are sampled 10 times per year for 1 - 2 years at a time (once a month excluding November and January) for most parameters (metals parameters sampled four times per year). Sampling regions are then rotated resulting in a complete assessment of the entire state every 10 years. Network stations are sampled for a variety of physical and chemical parameters, such as the following. Metals parameters (e.g. Lead, Mercury). 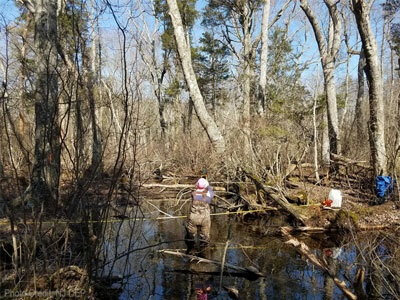 In 2013, the Barnegat Bay Long-Term Ambient Monitoring Program was established to monitor changes in water quality over time and to document changes produced through restoration efforts within the watershed. The program is also part of the DEP�s Barnegat Bay Restoration, Enhancement and Protection Strategy. To view information about the overall strategy, click here. 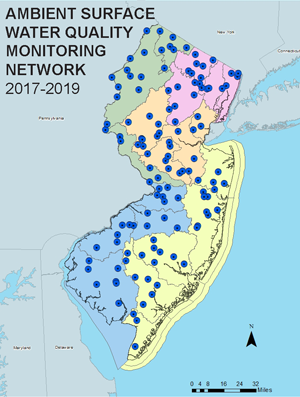 As of 2018, monitoring is being conducted at 35 stations within the Barnegat Bay watershed. The Bureau of Freshwater and Biological Monitoring and several partner organizations are responsible for monitoring at 18 freshwater tributary stations. 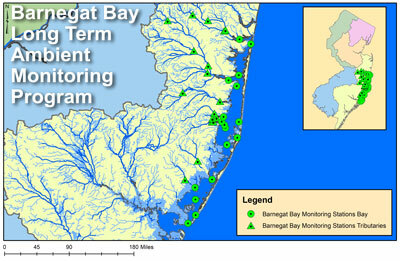 The Bureau of Marine Water Monitoring is responsible for monitoring at 17 bay locations. Sampling is being conducted at all 35 locations on a monthly basis. Network stations are sampled for a variety of physical and chemical parameters, such as the following. A full list of sampled parameters can be found by clicking the button below. Continuous monitoring of water quality parameters is also conducted at several of the bay monitoring stations. That data can be viewed on and downloaded from the Division�s continuous monitoring website. 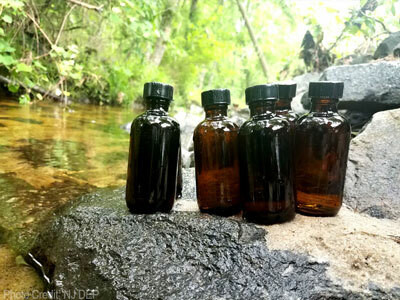 The monthly or quarterly sampling of streams are part of discrete monitoring efforts, in which individual distinct water samples are collected. Continuous monitoring involves using data loggers and sondes with sensors and probes to collect water quality data at pre-determined intervals (often at 15 or 30 minutes) for a specified period. 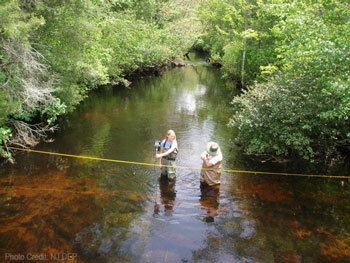 Continuous monitoring plays an important role in freshwater monitoring. In addition to characterizing baseline stream conditions more completely, continuous monitoring gives insight on diurnal (daily) and seasonal fluctuations that may not be seen with monthly or quarterly discrete sampling. Often, sites selected for continuous monitoring have been targeted for a specific parameter of concern, such as diurnal fluctuations in dissolved oxygen. 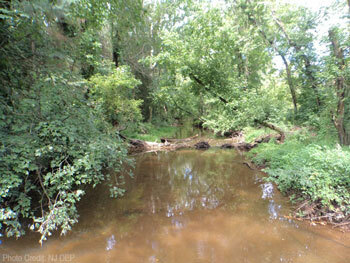 During the day, in warm summer months, dissolved oxygen, may become dangerously low and produce anoxic conditions. Such conditions may not be captured by discrete sampling. Currently, 40 sites are being targeted for continuous monitoring statewide. 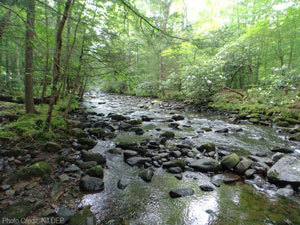 Often, sites are selected to assess water quality standards for certain parameters at specific streams. Other sites may have historical discrete data that suggest an exceedance of current surface quality standards in one or more parameters. Currently, continuous monitoring is used on a limited number of parameters (e.g. temperature, specific conductance, dissolved oxygen). 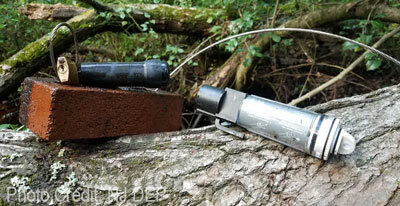 Other parameters such as total suspended solids and copper are still only monitored by discrete sample collection. Using single or multi-parameter data loggers and sondes, measurements are recorded at a specific time interval (every 15 minutes, 30 minutes) for a designated period, depending on project goals. For example, for diurnal dissolved oxygen monitoring, devices are deployed during the growing season (when photosynthetic activity will likely affect parameters such as dissolved oxygen) anywhere from a few days to several months.